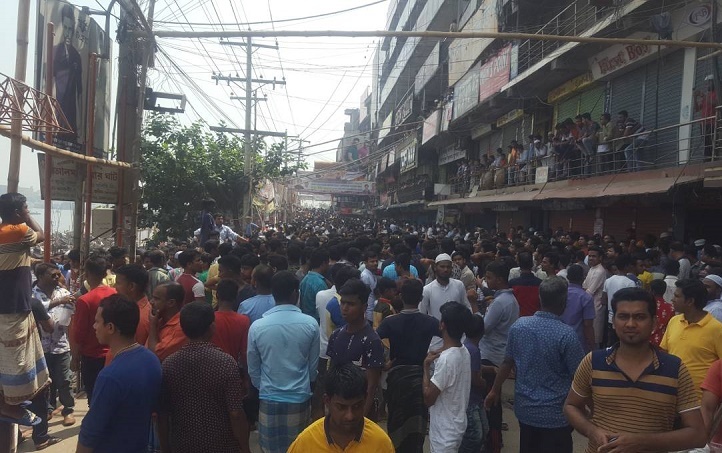 Garment traders, boat owners and workers demonstrated at Kaliganj Gudaraghat on Tuesday morning against BIWTA’s decision to relocate nine boat crossing ghats from Sadar Launch Terminal. AKM Arif, port officer of Bangladesh Inland Water Transport Authority, said there are nine ghats from Telghat to Babubazar Bridge for boat crossing. “BIWTA decided to relocate the ghats to Nawabbari area to avoid accidents,” he said. The protesters staged demonstration in Dakshin Keraniganj around 11am. During the protests, there was huge pressure on Nagormahal and adjoining ghats. A boat sank after being hit by a patrol speedboat of BIWTA port officer, witnesses said. Aziz Sheikh, president of Keraniganj Garments and Shop Owners Association, said they are protesting against BIWTA’s decision.